DOMOTEX asia/CHINAFlOOR 2010 took place March 23 through 25, 2010 in Shanghai, China at the SNIEC. Shanghai is the largest city in China and the most appropriate place to hold the largest trade fair for the floor coverings industry in Asia and China, DOMOTEX asia/CHINAFLOOR. 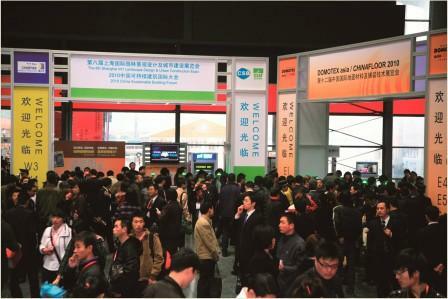 The Shanghai New International Expo Center (SNIEC) was mobbed with visitors on the first day of the exhibit hall. More than 19,000 attendees charged the registration counters to get a glimpse of approximately half a million square feet of exhibit space. 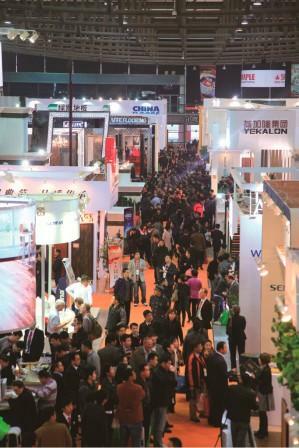 Exhibiting companies not only displayed their various products such as carpet, laminates, resilient and bamboo flooring but attendees were also able to see live product demonstrations from nearly 1,000 participating companies. The three day trade show resulted in a record number of 40,414 attendees which was 10% more from last year’s event. Held in conjunction with DOMOTEX asia/CHINAFLOOR were two educational forums. The Wood Flooring Forum which focused on Low Carbon Economics and Global Opportunities for the wood flooring industry brought in a staggering 500 attendees. 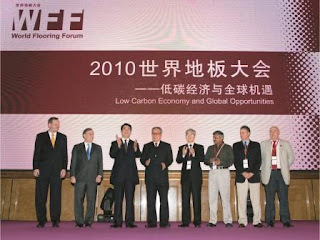 Co-Sponsored by the China National Forestry Product Industry Association, industry leaders spoke from around the world. The Wood Flooring Summit which was held on the second day of the trade show featured government officials and associations in the flooring industry to discuss legislative and environmental issues. Participants included Jürgen Früchtenicht, president of the European Parquet Importers Federation, and Mr. Mark Elwell, Board member of the National Wood Flooring Association of the United States. Ruud Steenvordenpast, former Vice President of the European Federation of Parquet Importers (EFPI), Director of Corporate Buying for Europe’s largest wood flooring provider, Fetim B.V. and consultant to the Floor Covering Institute moderated the discussions along with colleague Jim Gould. For more perspective on the Wood Flooring Sumit, read International Business Bustles at Domotex Asia Floor Covering Show and Wood Summit from Jim Gould and listen to this interview with Ruud Steenvoorden in Global Hardwood Legislation where he discusses progress being made around the world with legislation involving hardwood environmental issues including the Lacey act. Pictured above, from left to right, are Wood Flooring Summit participants: Jürgen Früchtenicht, President of European Federation of Parquet Importers (EFPI), Jim Gould, President of Floor Covering Institute, Wang Man, Executive Chairman of China National Forest Products Industry Association (CNFPIA), Wang Zhibao, Former Administrator of State Forestry Administration, PRC & Chairman of China Green Foundation, Zhang Shougong, Director of China Academy of Forestry, Deepak Gahlowt, Honorary Convener of Confederation of Construction Products & Services, Marco Antonio Beirao, Board of Directors of ANPM and Steven Suntup, Vice Chairman of Southern African Wood and Laminate Flooring Association (SAWLFA). And, in this next photo from Floor Covering News, you see from left to right: Dr. Andreas Gruchow from Deutche Messe, XQ and David from VNU/DACF, Jürgen Früchtenicht (editor Parquet Magazine and President of EPIF), Jim Gould and Ton Otten, CEO of VNU Exhibitions. Many thanks to the Floor Covering Institute and Floor Covering News for sharing photos and Jim Gould for sharing perspective! Next year DOMOTEX asia/CHINAFLOOR will return to Shanghai on March 23-25, 2011. If you attended this year's DOMOTEX asia/CHINAFLOOR, what did you enjoy most of the events you took part in? Added 5/19/10: Here is a link to the post show report for DOMOTEX asia/CHINAFLOOR 2010.